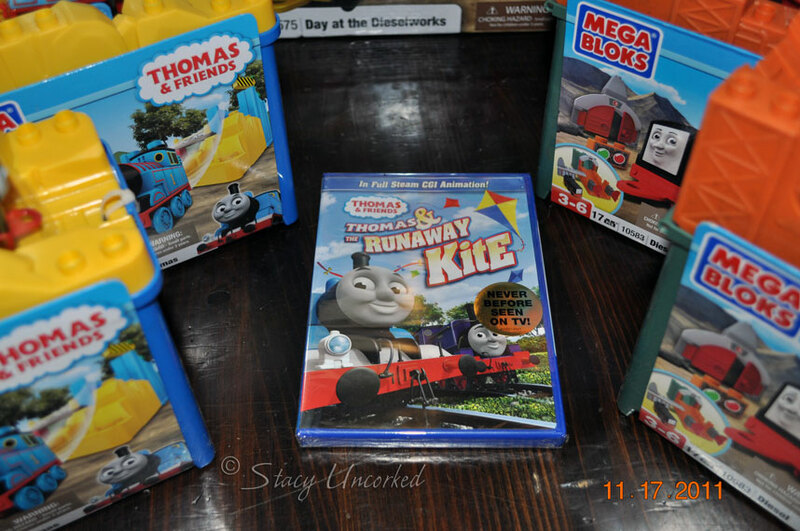 I recently had the opportunity to host a fun MegaBloks Thomas & Friends party. Talk about having a 4-year old in seventh heaven. Not only does Little Dude love Thomas, but he was a little jealous of the Lego’s Princess Nagger has been getting lately, all of which are not really appropriate for his age (and since he tends to scatter pieces of things all over, not appropriate for my poor feet). 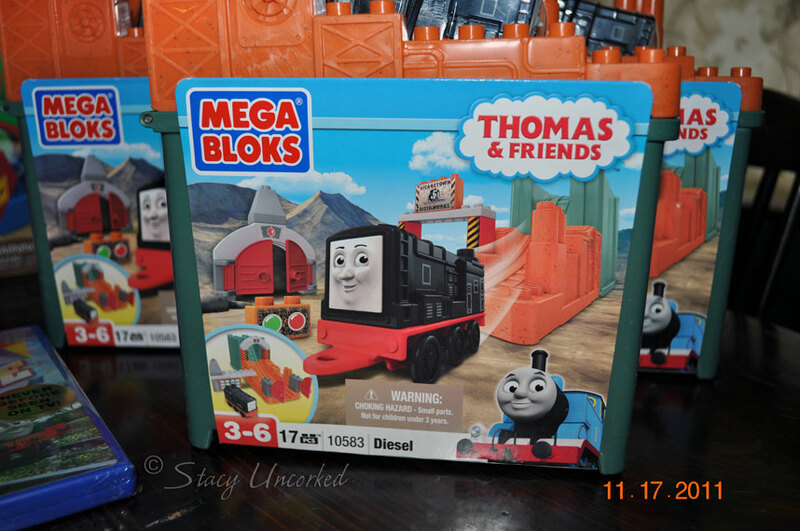 MegaBloks are a whole other ball game however, since they are appropriate for his age, and with the theme being Thomas? I scored major points with the Little Dude. Since Little Dude is new to our home, we haven’t had a chance to incorporate very many kids his age, so we decided to include Princess Nagger and her friends to make it a truly boisterous party. Even the 8 and 9 year olds had a great time, and were so nice helping the younger ones put their sets together and play. They all had an awesome time playing with the Thomas and Diesel sets, and thoroughly enjoyed the Thomas episode while eating snacks. I had fun with the other Mommies too, with a mini wine-tasting party while the kids ran around like crazy people. Everyone enjoyed themselves thoroughly – both mom and kids alike. MegaBloks are the perfect toy for a child of any age, and Little Dude was happy he had some of his very own to play with (now to get him not to leave them laying around, because they hurt just as much on bare feet). The bright colors are great for smaller children and building with these blocks enhances creativity. It’s so cool they have so many variations and themes to choose from – you can find a nice set whether you have a boy or a girl. Just ask Princess Nagger and her friends – they had just as much fun playing with the MegaBloks as the boys did. Be sure to check out all MegaBloks has to offer by visiting MegaBloks. You might find some great ideas for upcoming gifts – and rest assured they’re Princess Nagger and Little Dude Approved. How would you like to win a couple of MegaBloks sets for a lucky kid in your life? 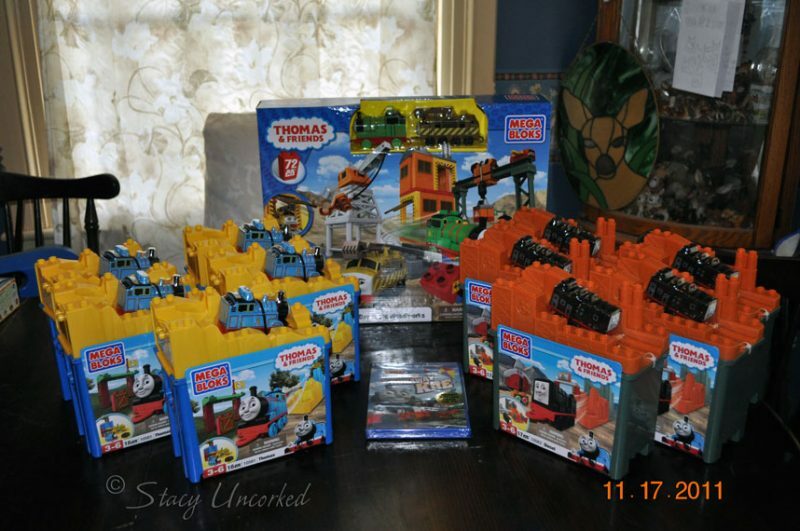 I had one of each of the Thomas and Diesel sets left, so I”m offering them to one lucky Stacy Uncorked Reader. You’re Welcome. (must be completed before any extra entries are valid) Leave a comment telling me what’s your child’s favorite toy – or yours as a child. You have until Midnight EST on December 11, 2011 to enter. One lucky winner will be randomly selected. I will email the winner who will have 48 hours to respond to the notification email or a new winner will be chosen. Open to U.S. residents. Good luck! 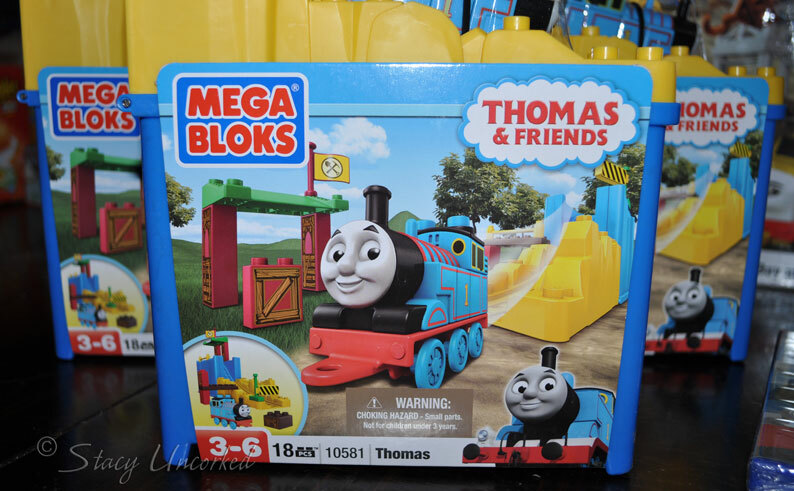 Note: I wrote this review while participating in a campaign by MegaBloks and MomSelect, and was the provided the amazing and fun Thomas & Friends Mega Bloks sets to facilitate this party. No other compensation was received. All opinions are mine, all mine – not influenced by any outside sources. At all. See my Disclosure Policy here. 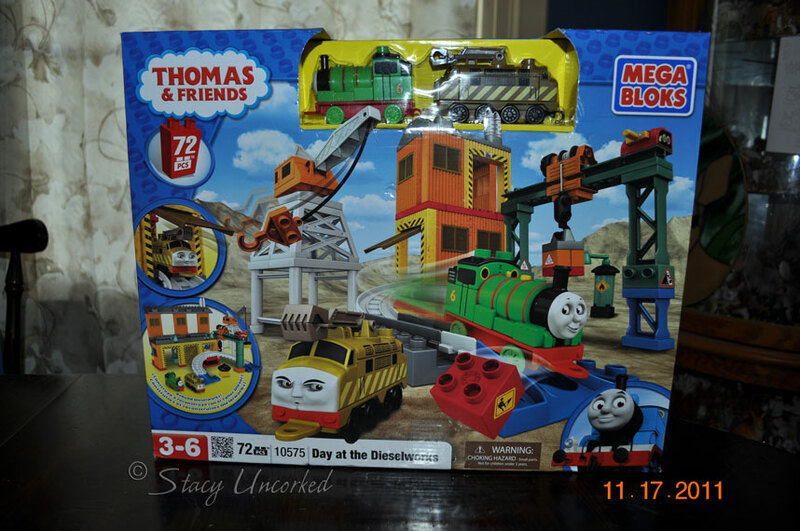 This entry was posted in Giveaway, Review and tagged Diesel, Giveaway, Little Dude, MegaBloks, Princess Nagger, Review, Thomas & Friends, Thomas the Train by Stacy (the Random Cool Chick). Bookmark the permalink. Those look way cool!! Alas…I have no littles to pass something like this on too! Even the grands are teens now!! Sigh! My daughters favorite toy is her play kitchen!